The Premier League season could still have significant twists and turns at both ends of the table. When Chelsea host Manchester United this weekend, there’s a real chance of one. Or is there? Manchester United have been ever-present in England’s top division since it was revamped to become the Premier League from 1992-93. They have been the dominant club of the PL era. They have faced 45 different Premier League opponents in that time. 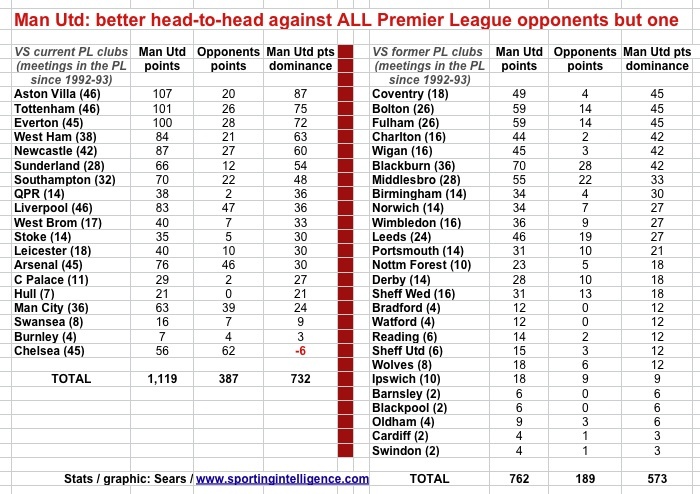 And they have a positive head-to-head record against all of them in that period … except Chelsea. 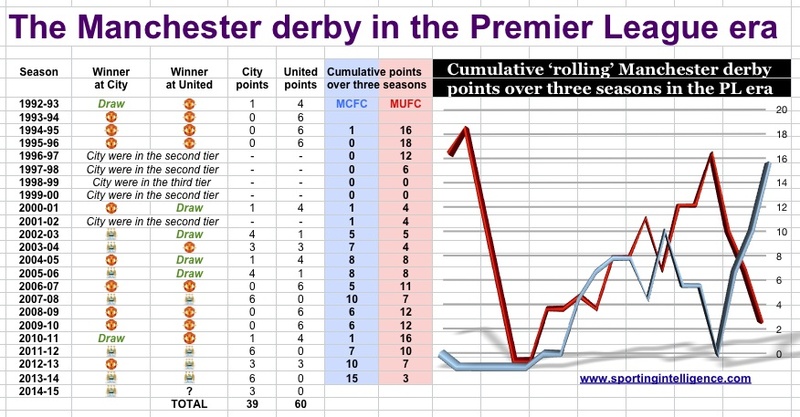 As the graphic below shows, United have dominated most teams over the piece, for example winning 107 points in head-to-heads with Aston Villa against Villa’s 20 points (from 46 meetings) to winning 49 points in PL games against Coventry, as Coventry picked up a measly four points from 18 meetings. United have lorded it over everyone from Tottenham to Everton, Bolton to Fulham to Leeds and Arsenal …. and everyone except Chelsea. The records of all the clubs against United are below, ranked by the sheer number of points by which United have dominated each team in PL games on aggregate. Apart from Chelsea, that is, who have played United 45 times in the PL era and won 62 points from those games compared to United’s 56 points. If United are to upset the apple cart and throw a spanner in the works of Chelsea’s title hopes, they will need to do so in the face of historical Chelsea dominance in this fixture. And if United can win, they will still be in deficit to Chelsea by three points in the PL era. Stoke City can already look forward to an eighth consecutive season of Premier League football come August. On the way to that they will be hoping to register their first Premier League victory over Southampton when the Saints visit the Britannia Stadium this weekend. The first four PL meetings of the two clubs were all drawn but Mane’s goal gave Southampton victory last October. Stoke will also be after a first Premier League win over Burnley when they visit Turf Moor in May. But first Premier League wins over Blackpool and Cardiff will have to wait a little longer ….